If you want to ace the course that you are studying, it all depends on the method, techniques and efforts that you put on it. The efficient procedure that you follow will bring you to position to boast about very good performance in high school or college. There is no specific way to approach a course, but keeping few things in mind will set beneficial guidelines for you. Buy the course books immediately! You just don’t want to attend the class then find out the “subject matter” of the day or the lesson that the lecturer will be teaching. You have to study it beforehand. You have to pick up the book and read what is going to be taught the next day. If you do this, you will save yourself a lot of trouble and confusion. Basically, reading the lesson is not enough, you have to find other sources to read about that lesson. A great tool can be the internet. Just turn on your PC and search everything you can find about that particular lesson. You will gain a vast insight into it. Your research may even help you to learn something that your own teacher may miss to explain. It gives advantage to also keep in track whether the lecturer is approaching the subject matter in a proficient way. Let’s be honest, a lecturer can be flawed too, especially when they just rely on their experience of teaching the lesson and they don’t do any research to update themselves. Preparation before what is being taught is all you need to stand out. After you have read the “lesson” and done some research on your own, you probably haven’t understood it all. You have to clear all the confusions by listing out the questions and asking your lecturer. The lecturers are there at college to help you to get the most out of every lesson. When you communicate and find the answers, you'll realize that during exams you are more likely to remember the lesson. You will also be appreciated by the lecturers because there aren’t many “curious” students out there. It challenges them to do their “homework” and be ready to face the questions you throw at them. The classroom lectures are abundant source of information regarding the lessons, so make sure that you note down the concepts in your notebook. The text book itself is a platform to be creative and use it for your advantage. When studying, take up a bunch of highlighters and paper tabs to mark the text books. Reserve the front end papers, margins, and the back-end papers for fancy thinking. Underlining and highlighting key words and phrases, with a suitable statement in the margin makes ideas much easier to assimilate. Mortimer J. Adler mentions that, "There are three kinds of book owners. The first has all the standard sets and best sellers -- unread, untouched. (This deluded individual owns woodpulp and ink, not books.) The second has a great many books -- a few of them read through, most of them dipped into, but all of them as clean and shiny as the day they were bought. (This person would probably like to make books his own, but is restrained by a false respect for their physical appearance.) The third has a few books or many -- every one of them dog-eared and dilapidated, shaken and loosened by continual use, marked and scribbled in from front to back. (This man owns books.)" Hence, don't be scared to mark your book, it helps to pour out your intellectual thinking on the pages of the book. Everyone struggles to remember the things they study. It’s not necessary to remember every detail but sometimes we have to remember statistics, numbers, dates, events and many other things. These things will determine the score you get in your exam. What can you do to keep your memory sharp? Use mnemonics. There are so many methods: method of loci, link system, peg system, acronyms. My personal favorite is to use peg system. Create your own set of image links with peg numbers from 1-50. It helps a lot in remembering a list. Method of loci is better in remembering historical events, as you can link the places you know with the events. 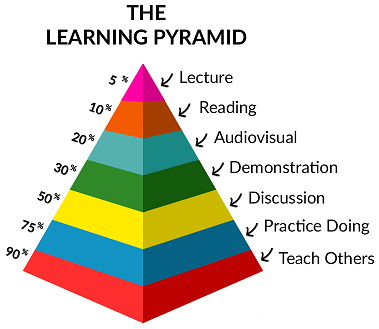 The Learning Pyramid, researched and created by the National training Laboratories in Betel, Maine, illustrates the percentage of learner recall that is associated with various approaches. The first four levels are passive learning. In contrast, the bottom three levels are active learning. Learning through the help of lectures is comparably less effective in retaining the information in comparison to teaching the knowledge to others. The activities mentioned in the pyramid are all equally important for a brilliant student. The effectiveness of any learning method, as presented in the Learning Pyramid, will also be affected by your own learning style. To maximize the effectiveness of your studying find the style that suits you the best. If your teacher assigns you to do some writing or studying, you definitely have to do it. Don’t miss any assignments. You will have a better chance recalling the things you studied if you also did the assignments. And other thing is, you don’t need to be assigned to read or write. Create your own assignments and challenge yourself to exclusively read many materials and write all you know about the lessons and subject matters. It's always tempting to cheat your way out of the exams, but that will be full of regrets. If you follow the previous steps, then there's nothing you wont be able to battle. If you will not be able to recall some information no matter what you do, then just write what you know. The exams aren't to test the eloquent language and flawlessness, they are there to test your version of understanding and comprehension. These tips require tons of work, but you can’t achieve something without putting in some effort. Though you have to keep concentrated on your course, have some fun and chill out sometimes. Always remember: Do smart work, not hard work. You have to get that knowledge which stays with you for a lifetime.